yes since our holiday away using the roof protector, I purchased another as a gift for my sisters family. As I said before, this made our tent stay an extra few degrees warmer while outside it was cold indeed. We recommend this to anyone purchasing an Outwell tent, it's a must have, keeps the roof clean also. We bought one of these to use over the Easter break, with it we found that despite the cold weather in France, our tent stayed surprisingly warm. So easy to add onto the tent even though we have an Vermont XLP. We're looking forward to using this in the summer where we'll turn it over to help keep the tent cooler (hopefully with our fantastic British summer, or we'll be turning it back over to keep us warm). After trying my sister-in-law’s canopy on our tent recently, A realised this is a Must Buy accessory for all those with Outwell tents, on cold nights it kept our tent that extra couple of degrees warmer and she, last summer showed us how just flipping it over using the other side upwards, kept her tent cooler than ours on the hot days. Let alone how it keeps muck and sap from the top of the tent. Our family really recommend this roof protector. 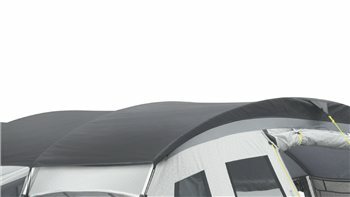 Hi i got a outwell Georgia 5p tent and front extension and had this for the latter part of 2014 and was thinking of getting the roof protector but had my doubts this working.